Mixed by Frédéric Carayol at M9 studio, Paris. 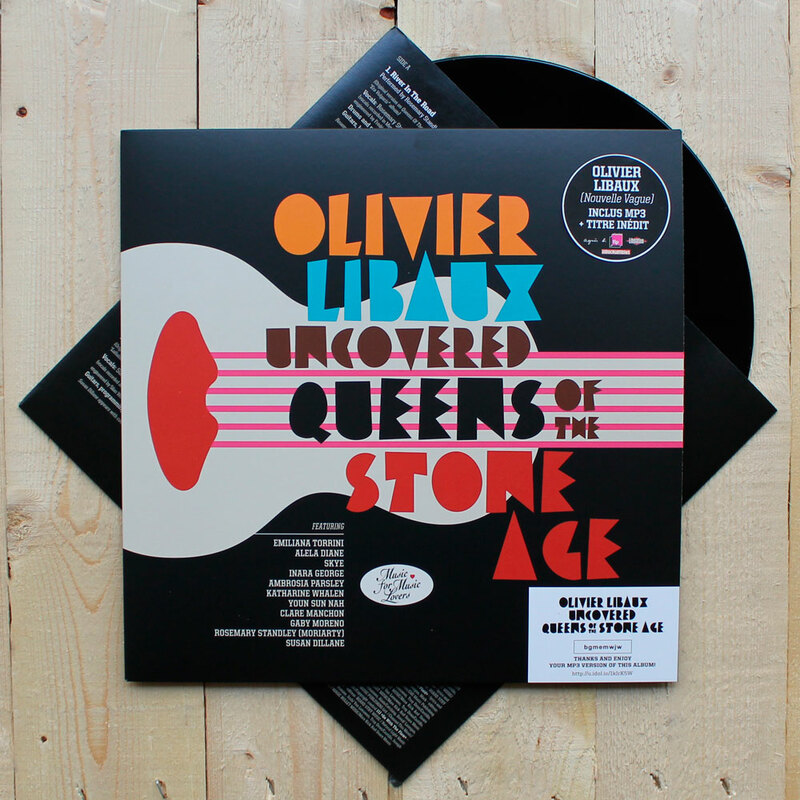 Album : Olivier Libaux Uncovered Queens Of The Stone Age. Featuring : Emiliana Torrini, Alela Diane, Skye (Morcheeba), Inara George, Ambrosia Parsley (Shivaree), Katharine Whalen, Youn Sun Nah, Clare Manchon (Clare And The Reasons), Gaby Moreno, Rosemary Standley (Moriarty), Susan Dillane. Vocals: Rosemary Standley (vocals recorded in Mercredi 9 Studio, Paris, France, engineered by Frédéric Carayol). Drums and percussions: Raphaël Chassin. Guitars, keyboards, programming : Olivier Libaux. Rosemary Standley (Moriarty) appears with courtesy of Air Ritmo. Vocals: Katharine Whalen (vocals recorded in Katharine’s farm, Efland, NC, USA, engineered by William Dawson). Keyboards: Mathieu Coupat. Drums and percussions: Raphaël Chassin. Guitars, bass, keyboards: Olivier Libaux. Katharine Whalen appears with courtesy of Five Head Entertainment. Vocals & vocal arrangement: Clare Manchon (vocals recorded at Clare’s place, Berlin, Germany, engineered by Clare and Olivier Manchon). Piano: Vincent Taurelle. Drums and percussions: Raphaël Chassin. Guitars : Olivier Libaux. Clare Manchon appears with courtesy of Frog Stand records. (Original version on Queens Of The Stone Age “Songs For The Deaf” album). Vocals: Inara George (vocals recorded in an apartment in NYC, USA, engineered by Inara George onto her Mac with a Apogee One). Keyboards, Vibes: Vincent Taurelle. Drums and percussions: Raphaël Chassin. Guitars, Bass, String arrangement: Olivier Libaux. Vocals: Susan Dillane (vocals recorded at Soundofsilas Studio, Birmingham, UK, engineered by Silas Wood). Guitars, programming, string arrangement: Olivier Libaux. Susan Dillane appears with courtesy of Domino Recording Company Limited. Vocals and vocal arrangement: Gaby Moreno (vocals recorded at Artbrait Studio in Los Angeles, CA, USA, engineered by Arthur Braitsch). Bass: Julien Decoret. Keyboards: Mathieu Coupat. Percussions: Raphaël Chassin. Guitars, keyboards, programming: Olivier Libaux. Vocals: Ambrosia Parsley (vocals recorded at CCP Sound Recording Studio, NYC, USA, engineered by Florent Barbier). Bass and double bass: Julien Decoret. Keyboards: Mathieu Coupat. Drums, drum arrangement and percussions: Raphaël Chassin. Guitars, keyboards: Olivier Libaux. Vocals: Youn Sun Nah (vocals recorded at Upper Music Studio, Seoul, South Korea, engineered by Seung Hoon Zeon). Bass: Julien Decoret. Keyboards: Mathieu Coupat. Drums and percussions: Raphaël Chassin. Guitars, keyboards, programming: Olivier Libaux. Youn Sun Nah appears with courtesy of ACT Music + Vision. Vocals: Inara George (vocals recorded in an appartment in NYC, USA, engineered by Inara George onto her Mac with a Apogee One). Keyboards: Vincent Taurelle. Drums and percussions: Raphaël Chassin. Guitars, bass, programming : Olivier Libaux. Vocals: Emiliana Torrini (vocals recorded at Mercredi 9 Studio, Paris, France, engineered by Frédéric Carayol). Keyboards: Mathieu Coupat. Bass: Julien Decoret. Drums and percussions: Raphaël Chassin. Backing vocals: Charlotte Savary. Guitars, programming: Olivier Libaux. Vocals: Alela Diane (vocals recorded at Sun Dial Studios, Neveda City, CA, USA, engineered by Tom Menig). Piano: Mathieu Coupat. Bass, keyboards, programming: Olivier Libaux. Mixed by Frédéric Carayol @ Mercredi 9 studio, Paris, France. Mastered by Greg Calbi @ Sterling Sound, NYC, USA. Be the first to review “Olivier Libaux Uncovered QOTSA - Vinyl Album” Click here to cancel reply.